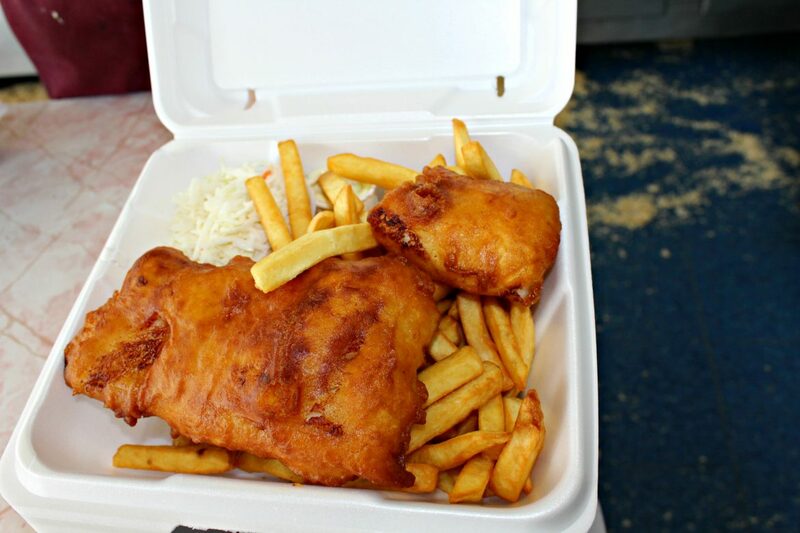 Patti J. Foley has Foley & Son Fish and Chips going strong in their 50th year. Back in 1967, the original Foleys – Evelyn and Eugene – thought it was a pretty sure bet that one of their five sons would want to be part of their new business. So they hung a sign above their shop at the corner of Franklin and Plantation streets that read Foley & Son Fish and Chips. Fifty years later the shop and the sign are still there, but it’s their youngest and their only daughter, Patti J. Foley, with assistance from a few others each week, who is running the show – balancing the books, cutting the fish and sweating by the fryolators. The original sign still hangs above 274 Plantation St.
Years ago, there were several fish-and-chip restaurants in Worcester, including Robert’s Fish and Chips, named after Robert J. Sutherland, who was also known as the King of Fish and Chips in Worcester. Sutherland, 89, died in Florida on Feb. 14, 2016. 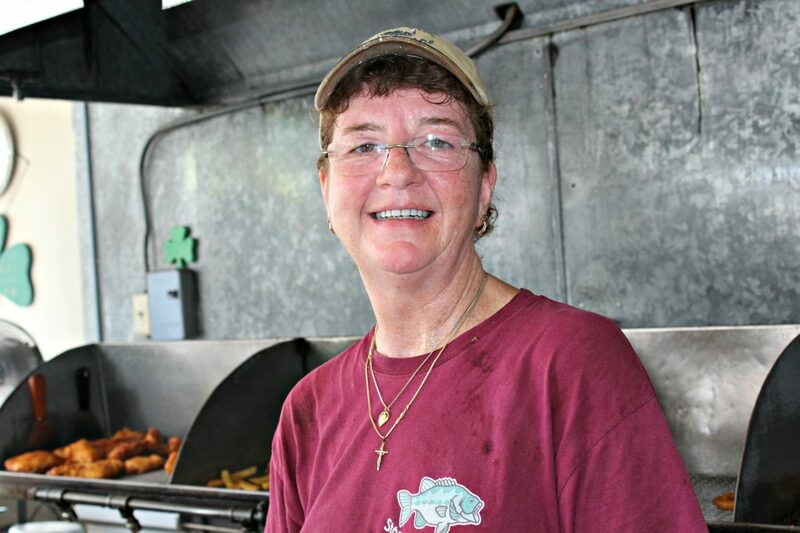 When Foley’s mother decided to retire in 1996, Patti purchased the business from her to keep it going the same way it had been for the previous 29 years. Her father retired, too, in 1996, but her mother worked with her daughter for two years during the day. “She’d cut the fish and made sure I have everything under control,” Foley said. The business still gets its fish from A.P. Fish Co., on Millbury Street and Grafton Street in Worcester. And they get their supply from the Boston docks. What else would we order but the fish n’ chips?! As it was decades ago, Foley & Son is open 10:30 a.m. to 8 p.m. on Fridays. 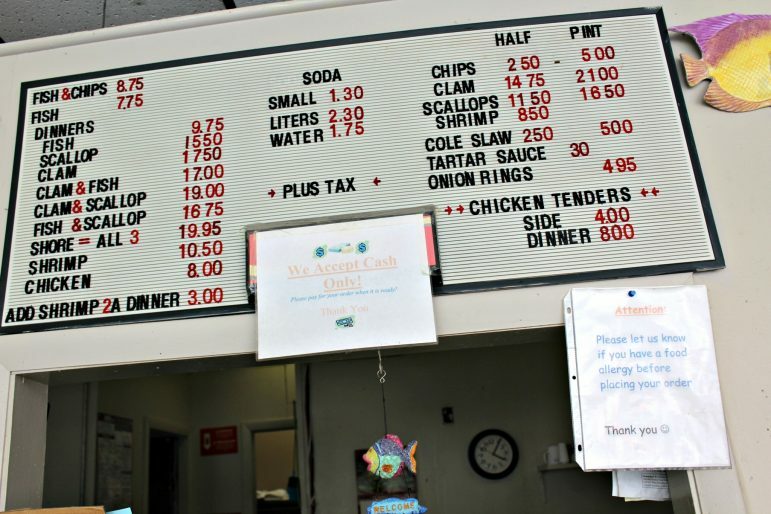 Besides fish and chips and scallops, the menu is classic New England fish shack: fried whole belly clams, shrimp and onion rings. It also has homemade coleslaw and tartar sauce. But nothing could prepare them for the crush of people on that Ash Wednesday, which is the first day of Lent for Catholics. Historically, Catholics usually ate fish on Fridays as a vestige of the “no meat on Fridays” rule, which still applies to the Lenten season. “I didn’t even know where Westminster was,” Foley said. Over the years, “I usually have four people that work with me every week, and during Lent, two more people come in to help,” Foley said. And during that Lenten season, the business will sell between 400 and 500 pounds of fish on Fridays. “It’s basically remained the same throughout most seasons. Summer might be a little slower due to people having cookouts and vacation plans. And a few decades ago, factories in Worcester would close for two weeks in July, so it was slow then, too,” she added. The Foley’s menu has rarely changed over the years. Clams and scallops come in a distant second and third place as the most popular items. The dinners that feature fish, scallops or clams come with french fries, coleslaw and tartar sauce. There are no booths or chairs, although you could find a makeshift resting spot on the carpeted top of the radiator that secures the window looking out onto Plantation Street. In fact, it would be against the law if people began to make themselves at home with a folding table or chair in the waiting area. The business never sought to serve customers like a traditional restaurant, which requires another type of common victualer’s license. And so it remains today. According to TripAdvisor comments online, several customers of Foley & Son have found comfort crunching the batter-laden fish in their cars. Or they found refuge under a canopy as a makeshift umbrella while contently chewing on the sun-tanned whole body fried clams, scallops, chicken tenders and fries. “I’m very fortunate and blessed that we keep going. I have a lot of regular customers. So without them, I’d never be here,” Foley said. She’s even warned her “regulars” that they better not change their order on the way. “As soon as I see them coming, I’ve already got their meal waiting for them,” she said. Who ordered the whole belly clams? Foley said she grew up on Grafton Street, and rents the space for the restaurant, as her mother did when she ran the business. The landlord, Ralph Ferraro and his wife, Bernadette, own the restaurant building and the garages, and live in the three-decker in the back of the restaurant. “They’ve been very good to me … and I’m very fortunate,” Foley said. There isn’t anything “official” planned for a 50th anniversary. “I don’t even know the month when it officially opened in 1967. So no, there is no big party planned,” Foley said. But there are still plenty of Fridays left in 2017 for all Foley’s regulars to celebrate. Art Simas spent more than 25 years in a number of roles at the Telegram & Gazette. After several years as a news reporter, he graduated to the copy desk. From there he went on to become a special sections editorial manager for the marketing and new media departments, where he spent the last seven years of his T&G tenure. He has a long history of covering myriad subjects in the city and currently freelances for a number of regional publications. Mariano: Which City Council candidate has the advantage in District 1? My grandfather was Robert Sutherland. I am very happy to see that someone is keeping the tradition alive and sticking with the proven business model. I now live in TX but I have long wished to be able to have a fish and chip dinner again like I had so many time in my youth. If I ever make it up to the Worcester again I will be sure to drop in. My mother worked for Mr. Sutherland when he owned Robert’s Dinner, on South Quinsigamond Ave., in Shrewsbury. I grew up with the Sutherland children and knew how hard Mr. Southerland worked getting and prepping the seafood. Many a time we would go and pick up a meal from his stores. If we ever get back there, we would love to have the clams and fried fish. 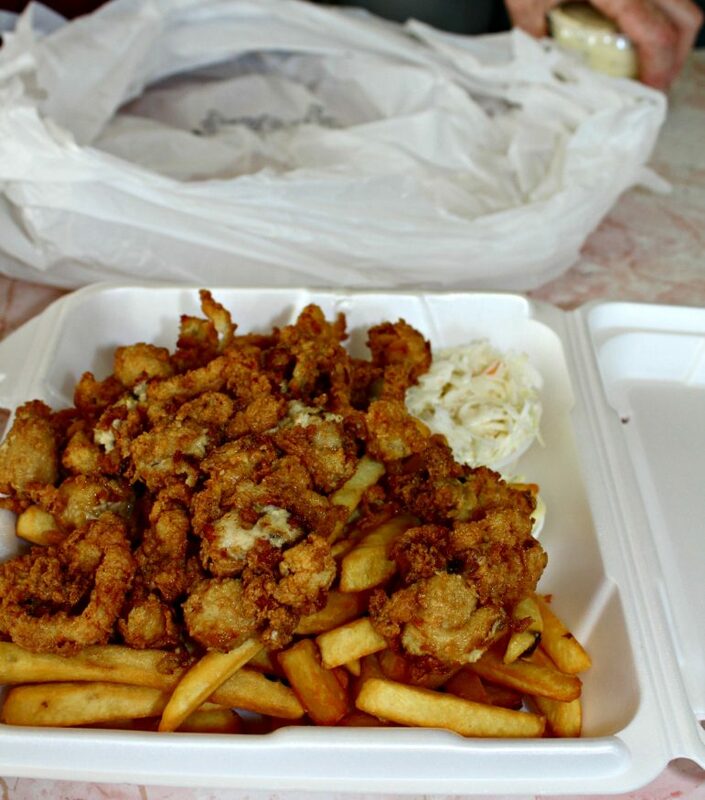 You can’t get fried clams anywhere like they do in New England. My maiden name is Donna Sutherland. I am the daughter of Robert Sutherland, the “King of Fish & Chips,” as he was affectionately called for so many years in Worcester, MA. (My eldest son, Michael Materazzi, has commented above.) The Sutherlands and the Foleys had a long and strong relationship. Patty Foley’s Mom and Dad were my Godparents, and we spent many, many family times together over all of my childhood. The adults were best friends for a lifetime. Dad started as the owner of a traditional diner, “Robert’s Diner,” on Route 9 across from the then existing White City Amusement Park. Over the years, things changed and evolved in his restaurant-owner career. He built his own little restaurant on a plot of land he purchased across from Jamesbury Industrial Park. He catered to the blue collar workers with awesome homemade style food. Eventually, he added fish & chips on Fridays to his menu, and that was so successful that his little restaurant was overwhelmed with customers waiting for their take-out orders. This led to his opening a separate little fish & chip take out store, then another, then another. It became confusing to customers which store was where, so he named some “Robert’s Fish & Chips,” another Betty’s, etc. Many years later, Dad opened a fish and chip store for me on Hope Ave. He trained me there for one year, then I bought it from him, and it became Donna’s Fish & Chips, a very successful business which I ran for many years. Along the way, Dad’s dear friend and a manager of one of his stores, Evy Foley, wanted to open her own store. 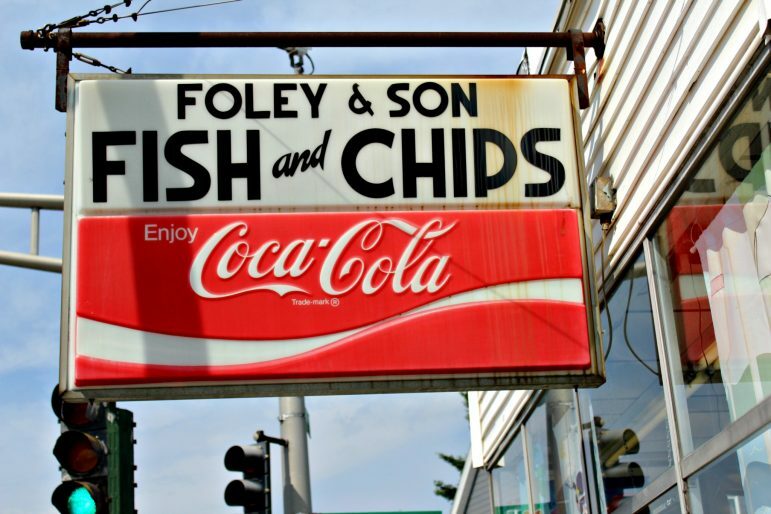 They agreed the chosen location would not be in competition with any of his existing stores, and Foley & Son Fish & Chips was born. Now, my Mom and Dad are watching from Heaven, and I’m retired in Florida. It’s been a beautiful friend-and-family endeavor from the start, and I smile as I see Patty still keeping this legacy afloat for the City of Worcester! Congratulations to the Foley family, who I hold dear in my heart, and a special round of applause to Patty Foley! She has held fast to Dad’s concept … do one thing, and do it well! Kudos to you, Patty!